How could you not try seafood if you come to Phuket, Khun Jeed Seafood is originated from Rad Nha( a special kind of noodle) Khun Jeed restaurant at this original over 17 years old Phuket restaurant with the secret of its delicious. Khun Jeed Seafood is the original seafood restaurant in Phuket is still be freshness, best quality and great test. We also serve with hospitality service. Khun Jeed Seafood is located in Phuket downtown, however we provide the freshest lobster, shellfish, crab and fish thus you can now have experience delicious seafood dishes at Khun Jeed Seafood like you sit by the sea restaurant. Here we emphasize on the best quality and great test of food moreover you can select your most favorite item from our seafood display counter then have prepare just the way you like by our professional chefs. 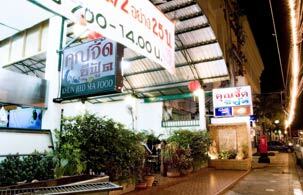 Rad Nha (a special kind of noodle) Khun Jeed restaurant is old Phuket restaurant with the secret of its delicious. If you come to Phuket, we recommended Rad Nha Khun Jeed that’s superior taste Rad Nha. Khun Jeed Seafood: 07.00 am. - 2 .00 pm. and 5.00 pm. - 11.00 pm. Rad Nha Khun Jeed: 09.00 am. - 8.30 pm.